Wow! The long awaited third LP from the Stiletto Boys is finally here, and to say that it doesn't disappoint would be a severe understatement. We're talking about one of my favorite bands of all-time. And even by the boys' lofty standards, Liberator is a stunning achievement. If this is truly the band's parting opus, what a way to go out! The story behind Liberator is pretty incredible. The first version of the album was recorded back in 2008, but Stiletto Boys singer Sean Wolfe wasn't 100 percent happy with the final product. In a bold move, he decided to scrap the whole recording and start over from the beginning. He had an idea in his head of how he expected Liberator to sound, and he wasn't going to be satisfied until it was perfect. Lesser artists would have just said, "Ah, good enough" and released the album as it was. But "good enough" is not in the Stiletto Boys' vocabulary. Come hell or high water, they were going to get it right. A lot of people probably figured that Liberator would never see the light of day. But Sean never gave up. He and guitarist Eric Benner recorded, produced, and mixed the album over a period of five years with band members tracking recordings in three different states. And now here it is - a pop masterpiece that was every bit worth the wait! It is, in my opinion, the best Stiletto Boys album. Arriving nearly 13 years after the release of 2000's Buzzbomb Sounds, Liberator is the band's most sophisticated and mature release to date. Yet it does not lose sight of what made the Stiletto Boys such a great band to begin with. The group's music remains rooted in the powerpop and classic melodic punk of the late '70s. But over a long career, the boys have cultivated a sound that is uniquely and fully their own. From the first strains of phenomenal opener "Cannon Fodder", you know this is a Stiletto Boys album. And for that, you are grateful! You know how sometimes you'll have a friend that you haven't seen in years, but as soon as you meet up with them again, it's like you never spent a day apart? That's what it's like listening to this album. When that first chorus hits, it's magic. Every time the Stiletto Boys make a new record, you can hear how their sound has progressed from the last one. They are never content to repeat themselves. But with each step forward, they manage to retain their knack for gorgeous melodies and flawlessly constructed hooks. And while I will always love the energy and immediacy of the band's earlier recordings, Liberator is equally satisfying in a very different way. Instead of whacking you in the head upon first contact, these songs grow on you. I've been hearing them in my sleep (not that I'm complaining)! In this age of instant gratification and bands rushing to get their music out there, it's great to hear a group that has clearly worked hard at honing its craft and realizing an artistic vision. Liberator is truly the punk/powerpop album the world needs right now. While there are some love songs on the record (the gut-wrenching "Happy Endings" is one of the boys' best songs ever! ), the scope and variety of the lyrics are beyond what anyone would have expected. If Liberator is "about" anything, it's about making one's way in a scary modern world and getting wise to the powers that are conspiring against us. Lyrics run the gamut from deeply personal ("Basement") to contemporary dystopian ("Follow The Leader"). And through a combination of insightful lyrics and highly pertinent sound bites, this album really implores people to stop being willing participants in their own oppression. While sometimes music serves as mere escape from the harsh realities of life, in certain cases it can actually inspire people to get out there and do something. The bad guys don't necessarily have to win. There's definitely meaning in the title of this album. Hats off to Sean, Casey, Benner, and Garvin for making a truly special record. And kudos to Ron from Zodiac Killer Records for believing in the band and this project. Anyone who questioned the time it took to make Liberator will be eating their words once they hear the album. Every time Sean insisted on re-doing a song, it was only because he knew they could still do better. And now the proof is in the pudding. The production is impeccable (listen to those harmonies! ), the songs are brilliant, and Benner's guitar work is positively sick. I never cease to be amazed at how talented these guys are. 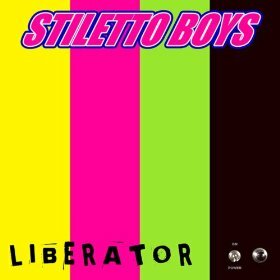 Liberator gives you everything from bouncy powerpop gems like "Self Destruction" to masterful minor key ballads like "Ttwsyf". Yet no song seems out of place. This is not just 15 songs randomly thrown onto a CD. It's a true album - which may be a dying concept in the digital age. Go to http://www.zodiackillerrecords.com/ for ordering information - or download it immediately from iTunes! Thanks for the review... Benner and I are writing songs for a new record, tentatively entitled "Single Point of Failure". Hope you are well. Lipstick Homicide v. The Turkletons!